Home More Moments in Time: a Free Ebook! 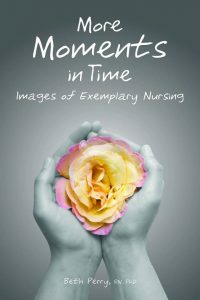 Several years ago I found a book titled, More Moments in Time: Images of Exemplary Nursing. The book is by Beth Perry, a nurse from Alberta. The book is based on a study of the beliefs, actions, and interactions of a group of extraordinary palliative care nurses. Full of stories, poetry and wisdom, this book inspires while teaching practical skills. It is available right now, for free as a downloadable e-book (go to http://www.aupress.ca/index.php/books/120158 and choose the tab Free PDF). Beth’s goal is to build caregivers’ skills and to remind us all of the rewards of caring for others. This entry was posted in Hospice Palliative Care and tagged ebook, Nurses, palliative. Bookmark the permalink.